Ensure that all key operating parameters (temperatures, pressures and flow rates) comply with the recommended levels. Always use seawater filters/strainers of the correct mesh size. Avoid operating the freshwater generator in polluted/contaminated waters. 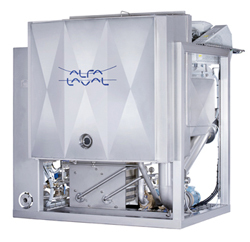 Shut down the freshwater generator in accordance with Alfa Laval instructions. Do not operate the freshwater generator without the recommended anti-scale chemical. Log process parameters daily to monitor the condition of your freshwater generator. Clean the salinometer electrode on a regular basis. Use only sulfamic acid with a corrosion inhibitor for acid cleaning. Always use genuine Alfa Laval spare parts and maintain an adequate stock of key spare parts. Keep the unit clean. Avoid using oil or grease, which is unsuitable for human consumption. Remember, it’s your drinking water!